BACKBEATS: DIGGERS DELIGHT-MORE RARE-GROOVE GEMS. For many DJs and music-lovers, crate-digging for hidden rare-groove gems is the musical equivalent of an Olympic sport. Whether its record shops, thrift stores, dusty warehouses or junk shops, there’s nowhere that the determined crate-digger won’t head. Nowhere is off-limits in their search for rare of obscure vinyl. A crate-digger is the modern equivalent of a big game hunter. The only difference between the two, is that a crate-digger’s hunting musical gold. Often, a determined and persistent crate-digger can strike musical gold by finding a rare and valuable album for little, or no money. That however, is fast, becoming a thing of the past. The reason for this is the internet. Nowadays, people have become much more savvy about how much vinyl is worth and bargains are becoming harder to unearth. Granted, there’s still bargains out there, but they’re becoming even harder to find. Not helping the situation, is the economically straightened times we live in. Being smack bang in the middle of the biggest recession in financial history, people have less money to spend on vinyl. 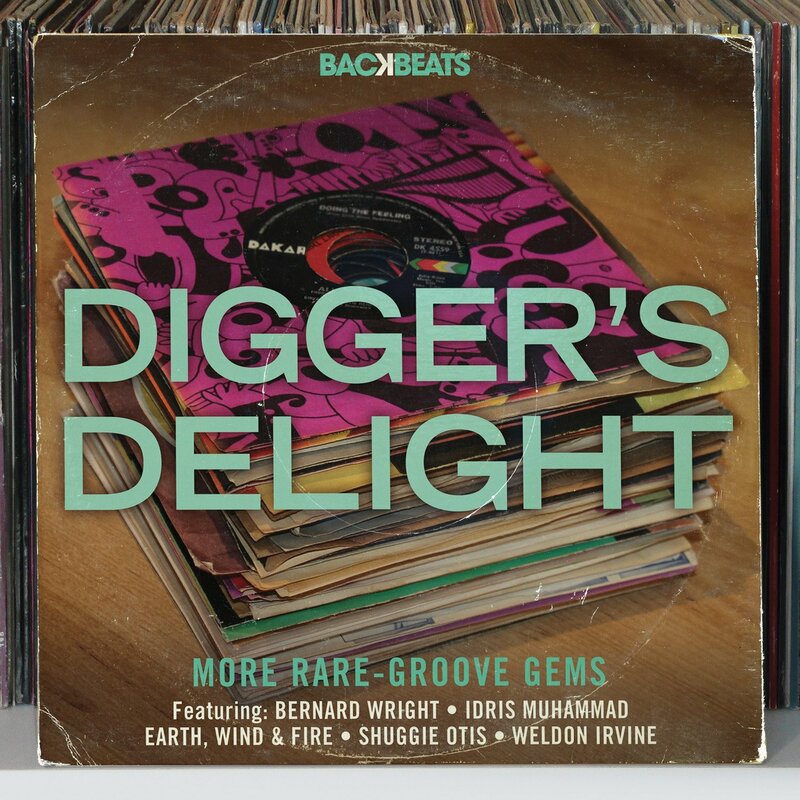 So for anyone looking to compile a collection of rare-groove gems, a good place to start is Backbeats: Diggers Delight, the latest installment in Harmless Records’ Backbeats compilation series, which will be released on 20th May 2013. Featuring fifteen slices of rare-groove, Backbeats: Diggers Delight, features some obscure, rare and valuable slices of funk, soul and jazz, which I’ll pick the highlights of. The fifteen funky, soulful and jazzy cuts on Backbeats: Diggers Delight are from labels like Arista, CTi, Epic, RCA, Chi-Sound, Columbia, Universal and Buddah Records. This includes contributions from Weldon Irvine, Shuggie Otis, Idris Muhammed, Mandrill, Larry Young’s Fuel, Jimmy Castor Bunch and The Modulations. Looking at the track listing, and given their rarity, these tracks would require deep pockets and determination to find. After I’ve picked the highlights of Backbeats: Diggers Delight, I’ll tell you how much it would cost you buy the fifteen tracks on Backbeats: Diggers Delight. My first choice from Backbeats: Diggers Delight is Herbert Law’s Family, which was the title-track to his 1980 album. Released on Columbia, an all-star band accompanies Hubert. This includes bassist Nathan East, drummer Leon Ndugu Chancier and pianist Bobby Lyle. As the track unfolds, it’s mellow and understated. Then, all of a sudden, the track explodes into life. Key to this soulful, jazzy and funky track, is Debra Law’s vocal. Hubert’s sister delivers an impassioned, powerful vocal. Idris Muhammed released Turn This Mutha Out in 1977, on Kudu. One of the tracks on Turn This Mutha Out was Crab Apple, which was written by producer David Matthews. Of the seven tracks on Turn This Mutha Out, Crab Apple is head and shoulders above the rest. Key to this are Michael Brecker’s schorching saxophone, Wilber Bascomb’s pounding bass and Cliff Carter’s synths. With Idris’ drums providing the heartbeat, the result is a tough, funky track that quite simply, is one of the highlights of Backbeats: Diggers Delight. Lalo Schifrin forged a reputation as one of the most talented and innovative film composers of his generation. When not writing film scores, Lalo enjoyed a successful solo career. His 1977 album Towering Toccata featured Theme From King Kong, z five minute fusion of funk, rock and jazz. With blazing horns, the funkiest of rhythm section and rocky guitars Lalo creates a dramatic, Uber funky reinterpretation of a familiar track. One of music’s best kept secrets is Shuggie Otis, who released four albums between 1969 and 1974. The last of this quartet of albums is 1974 Inspiration Inspiration, which featured Aht Uh Mi Hed. Like all of Shuggie’s music, It’s a captivating fusion of soul, funk, psychedelia, rock and jazz from one of music’s most reluctant stars, whose music everyone should discover. All too often, compilers overlook Weldon Irvine’s music. Thankfully, Dean Rudland, who compiled Backbeats: Diggers Delight is guilty of that. We Gettin’ Down was written by Weldon and featured on his 1975 album Spirit. Released on RCA Victor, it’s a slow, funky and atmospheric track. Squelchy synths usher in blazing horns, rocky guitars and a myriad of percussion. Soon, strings are dancing in appreciation, while Weldon’s keyboards provide a backdrop to a compelling and often, beautiful fusion of harmonies, percussion and swathes of strings. Back in 1973, Earth, Wind and Fire embarked upon a journey where critical acclaim and commercial success were ever-present for a decade. The second album in this unbroken run success was 1974s Open Your Eyes. It reached number fifteen in the US and number one in the US R&B Charts, and was certified gold. Mighty Mighty was a single Open Your Eyes, which reached number twenty-nine in the US Billboard 100 and number four in the US R&B Charts.Tough, funky, soulful, laden with hooks and dance-floor friendly, it’s no surprise Earth, Wind and Fire were so successful. Not only did The Brecker Brothers enjoy a successful recording career during the seventies, but were the go-to-guys for anyone looking for a hot horn section. The sound of Michael’s saxophone and Randy on flugelhorn or trumpet graced many an album. Their debut album was 1975s The Brecker Brothers. Released on Arista, it featured Sneakin’ Up Behind You, which is best described as an infectiously catchy, melodic and timeless slice of jazz-funk. The last track I’ve chosen from Backbeats: Diggers Delight just happens to be the final track. This is The Modulations’ It’s Rough Out Here, which was the title-track to their one and only album. Released on Buddah Records in 1975, it’s a tough, funky and soulful track. Disco strings accompany the vocal while soaring harmonies, growling horns and vibes provide a backdrop as seamlessly, soul, funk and disco unite peerlessly. Given how obviously talented The Modulations were, it’s a pity their recording career amounts to just one album. Mind you, what an album It’s Rough Out Here is. Of the fifteen tracks that feature on Backbeats: Diggers Delight, each of compiler Dean Rudland’s choices deserve their place on this compilation. With neither faux pas nor filler on Backbeats: Diggers Delight. That’s quite a feat. Usually, on compilations there’s the odd track that disappoints. Not here. No, not at all. Instead, there’s just quality rare-groove from Angela Bofil’s People Make The World Go Round right through to The Modulations’ It’s Rough Out Here. Soulful, funky and jazz-tinged, Backbeats: Diggers Delight is an eclectic selection of quality music. It’s a combination of a few familiar tracks, rarities and hidden gems. For anyone whose a fan of rare-groove, then they’ll thoroughly enjoy discovering the delights of Backbeats: Diggers Delight, which will be released by Harmless Records’ subsidiary Backbeats on 20th May 2013. in fact, Backbeats: Diggers Delight is the perfect companion to Backbeats: In The Pocket-70s Jazz Funk. Both compilations are soulful, funky and jazzy, and will be welcome additions to any self-respecting record collection. Standout Tracks: Idris Muhammed Crab Apple, Lalo Schifrin Theme From King Kong, Shuggie Otis Aht Uh Mi Hed and Weldon Irvine We Gettin’ Down. ← BACKBEATS: IN THE POCKET-70S JAZZ FUNK.